With a pristine beach on one side and a wildlife-rich national park on the other, this eco-resort is an adventurer’s paradise. Think of a creature you might see on a beach vacation. Do elephants, sloth bears, and leopards come to mind? Probably not. But they should! Because that’s what you can expect to see if you vacation at the new Wild Coast Tented Lodge—a spot that’s quickly earned a place on our travel bucket list. The latest creation from Sri Lankan resort group Resplendent Ceylon, which operates a handful of luxury resorts across the country, the lodge is ideally located “where the Indian Ocean meets the jungle”—specifically, right next to Yala National Park, renowned for its dense leopard population. By day, guests can attend lectures and workshops to learn about the resort’s fascinating jungle surroundings before venturing out on a safari-style tour of the wild. Outside of the incredible safaris, the resort is a wonder in itself. Twenty-eight tented cocoons (the guest rooms) in groups of four each fan out, staggered, away from the resort’s public spaces, creating a layout that—from overhead—resembles leopard paw prints leading out into the jungle from the beach. 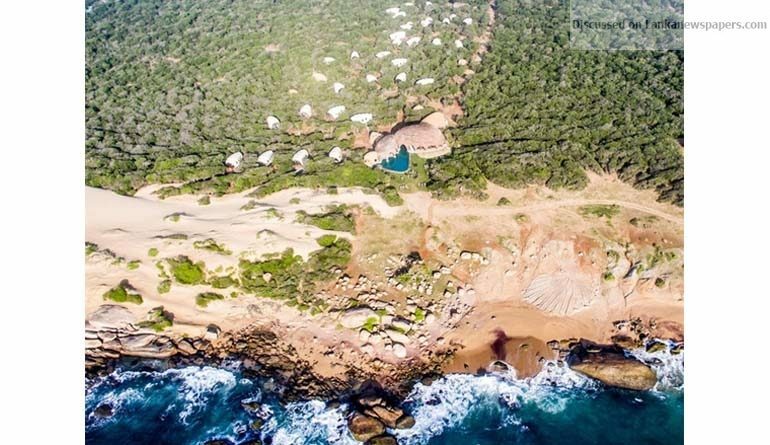 Each of the fabric-clad structures is designed to blend in with the surroundings, with the distinctive cocoon shape nodding to the smooth boulders that scatter the beach. Inside, luxurious details like vaulted ceilings, freestanding copper bathtubs, teak floors, and leather furniture come together to create a “colonial expedition chic” vibe. And in case you had any doubts as to whether these tents err more on the side of glam or campy, each one comes with AC, WiFi, a mini bar, and a sound system for playing your favorite jungle tunes. And there are more amenities once you venture outside your room to prove this place definitely puts the glam in glamping, including spa services, gourmet Sri Lankan cuisine, private beachfront dinners, and plunge pools. Rates (all-inclusive!) start in the $600s for two people, and come with all meals, drinks, and other amenities—plus a daily safari. (But rates just for the room can be arranged, too.) Pretty wild deal, no?